New Zealand born Helen Thayer's life is a testament to setting goals and achieving them. First woman to travel alone to any of the world's Poles when she skied at age fifty to the Magnetic North Pole without dog sled, snowmobile, resupply or support. First woman to walk 4,000 miles across the Sahara from Morocco to the Nile River. In another world's first, Helen walked 1,600 miles across the Gobi Desert at age sixty-three. Kayaked 2,200 miles of the Amazon River. In a unique study in the wild, Helen lived near a wolf den above the Arctic Circle for a year. Helen won the American national luge championship and represented three countries in international track and field. She has climbed some the world's highest mountains. The Explorer's Club awarded Helen the Vancouver Award for Excellence in Exploration. With presentations to audiences worldwide, she has addressed countless organizations in the last two decades -- from one-room schools in the Amazon to the White House. Her Books: A bestselling author, Helen writes about her explorations in the books: Polar Dream, 3 Among the Wolves, Walking the Gobi. Her books have been translated into nine languages. Her future goals: Helen will continue to explore the remote corners of the world and create educational material for students, kindergarten to grade twelve, based on her adventures. In the scope and significance of accomplishments achieved by women, Helen Thayer stands alone. She travels without guides or support teams. At times she has overcome incredible obstacles to reach her goals through dedicated planning and problem solving. In a career that spans the planet north to south and east to west, her diversity and experience are without compare. 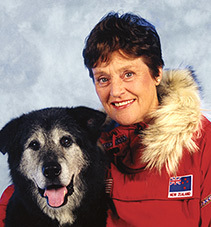 Named one of the Great Explorers of the Twentieth Century by National Geographic and honored in a ceremony at the White House, Helen is truly “one-of-a-kind.” She uses her vast experience to convince young and old that all great triumphs are realized by total commitment to a goal, to planning for success and finally determination to reach the top. She explains, "I've been there and here's how I did it." Helen Thayer is a board member of The Washington State Chaplain Foundation. This all volunteer ministry is one of providing comfort, care and counseling. A Washington State Chaplain must be secular, must not advance religion and does not become involved in excessive government entanglements. Because they work closely with State Troopers and Game Wardens, they frequently find themselves placed in harms way as they respond to situations of significant and sometimes extreme danger. One example was the land slide in Oso, Washington that killed 43 people and destroyed an entire community. They were not only available to the police and search and rescue agencies, but were also there to help the general public, many of whom desperately searched in the mud and debris for loved ones and friends. Learn more at the Washington State Chaplain website. Helen & Bill Thayer have been receiving attention in China for their Gobi Journey. Helen's book, based on the Gobi experience, Walking the Gobi, has been translated into Chinese and is being used in classrooms in China. In addition, several articles about the Thayers have appeared in popular Chinese outdoor magazines. READ MORE about the Chinese Connection. Helen spoke at our retreat. Her ability to use her amazing journeys to illustrate goal setting, problem solving, excellent planning and overcoming difficult challenges relates perfectly to the corporate world. Her program was an invaluable addition to our retreat. Her story encourages us to look to new successes and look beyond our personal horizons. In our after-the-event-evaluation, Helen's program rated the highest we have heard in the last 16 years of this annual event. We look forward to inviting her again. READ the Alaska Airlines Magazine article about programs underway at Adventure Classroom. READ the recent article about Helen Thayer in Women's Adventure Magazine. READ how Bill and Helen Thayer have strengthened their lifelong bond to each other by sharing seemingly impossible challenges. Here in Helen's words are descriptions of two adventures they shared together.